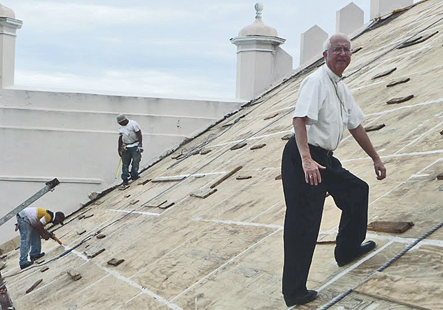 Bishop Herbert Bevard inspects restoration work on St. Thomas’s Cathedral of SS. Peter and Paul, overlooking the city’s harbor in the U.S. Virgin Islands. As a child, born Presbyterian in Baltimore and raised in very rural and then-very Protestant Oxford, Chester County, Bishop Herbert Bevard in his wildest dreams would not have imagined someday he would be the Roman Catholic Bishop of St. Thomas, U.S. Virgin Islands. They are as far east as you can travel and still be in the U.S.A.
What he could very well imagine is he would someday be a Catholic priest. The desire within him to become Catholic traces back to when he was 11 years of age or so. “I can’t remember what the spark was but I remember the desire itself and telling my parents,” he said April 6, in an interview as he concluded a lightning trip back to Philadelphia to preside at the funeral of Msgr. George Tomichek, a close friend from back in their days at St. Charles Borromeo Seminary. His probably bemused parents, Charles and Catherine Bevard, gave him permission to take instruction in the faith but withheld permission for baptism until he reached his age of majority. He continued his education in Oxford and Baltimore, and was formally baptized Catholic at Sacred Heart at age 18. After two years at Dickinson College he entered St. Charles Borromeo Seminary and was ordained May 20, 1972. After ordination, there were assignments as parochial vicar in Media, Chester, South Philadelphia, Bensalem and pastor for 14 years at St. Athanasius Parish in West Oak Lane. He was also for a brief period regional vicar for Philadelphia-North. His elevation to the episcopacy and appointment as bishop of St. Thomas in 2008 was certainly a change of pace. It sounds like a great gig, and in many ways it is. But in the end, whether one is pastor of St. Athanasius or bishop of the Virgin Islands, one ministers to people. There is a lot more to the Virgin Islands than tropical beaches as seen from the deck of a cruise ship. 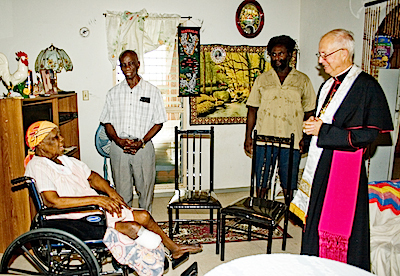 Bishop Bevard, right, visits the home of a sick parishioner during a visit to St. Joseph Parish on the island of St. Croix in May 2013. One source of joy to him was his mother’s conversion to Catholicism in 1977, followed by his father’s deathbed conversion in 1987, and just last year that of his only sibling, his brother Charles. The U.S. Virgin Islands, just east of Puerto Rico, were purchased by the United States from Denmark in 1916 during World War I reputedly to prevent a possible seizure by Germany to use as a site for a submarine base. There are three relatively small islands with a total population of not much more than 100,000. Within his diocese, Bishop Bevard has eight parishes and two chapels, spread out over the three islands. From St. Thomas, where his Cathedral of SS. Peter and Paul is located, it is a ferryboat ride to St. John, but for St. Croix it is a plane ride. Although the Virgin Islands have a higher median income than most countries in the region, that can be deceiving, Bishop Bevard explained. Most of the wealthier Islanders are Protestants whose families have lived there for generations. “We have some with no financial worries and some middle class, but many who are the poorest of the poor,” he said. While tourism is the single biggest industry in the Virgin Islands, for the most part the visitors are coming on cruise lines, with perhaps a one-day stop, and the people usually use that time to visit the shops and the beaches. There are others who come for a week or two in time shares or even for a season, and they can be generous, Bishop Bevard noted. In truth the diocese must depend on outside assistance to cover expenses, but because it is part of the U.S. it does not receive funding through the Society for the Propagation of the Faith directly or from some of the mission societies in Germany or other parts of Europe. “Help does come from the Papal Foundation, Catholic Extension, Catholic Home Missions and the Black and Indian Missions Collection,” Bishop Bevard said. Just as in Philadelphia, the Diocese of St. Thomas’s cathedral is under the patronage of SS. Peter and Paul, and imitating Philadelphia’s cathedral he has instituted as a fundraiser an annual Keys and Sword Award, incorporating the symbols of the two patron saints. 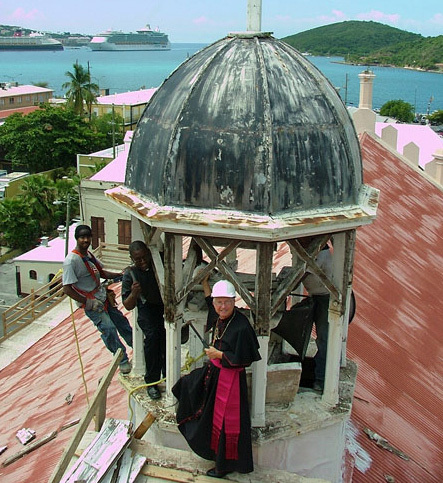 The bishop scales the roof of the Cathedral of SS. Peter and Paul, for which he leads the annual Keys and Sword Award fundraiser to restore the church. Because the islands were ruled by a Protestant nation during most of their history, most Christians are Protestant. A majority of the residents are of African descent, tracing back to slaves imported by the Danes before they abolished slavery in 1848. “I got that idea from Msgr. Michael McCulken and I’m shameless in stealing his idea, and it has been very successful,” he said. One of last year’s winners of the Keys and Sword Award was Boston Cardinal Sean O’Malley, who was himself bishop of the Diocese of St. Thomas from 1985 to 1992, and who came back for the ceremony. “The award has been a great blessing,” Bishop Bevard said. When all is said and done, the most effective zealous and effective champion of the diocese is almost certainly the bishop himself. One thing the Diocese of St. Thomas does not lack is vocations to the priesthood. Indeed, they are a point of pride. Most of the candidates come from outside the diocese, “men who are attracted to the idea of being a missionary,” the bishop said. 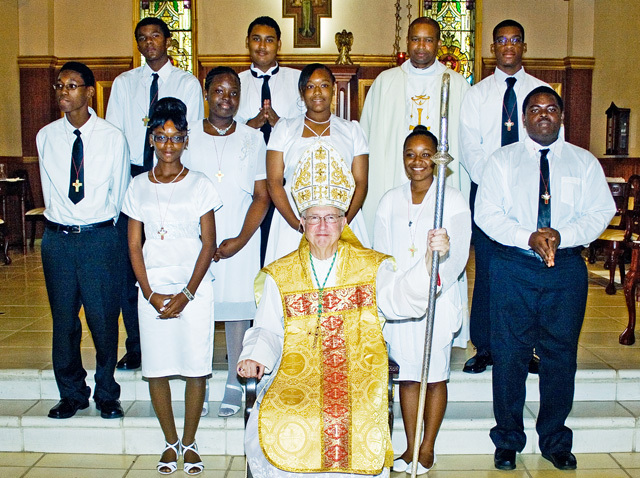 The bishop poses for a photo with the nine newly confirmed parishioners of St. Joseph Church on St. Croix, along with their pastor, Father John Mark, in May 2013. Last year Bishop Bevard ordained three priests and this year he has two deacons who will be ordained priests, and two more men discerning, an astonishing number considering the size of the diocese. Not only are there sufficient priests to fill the needs in the diocese, four priests of the diocese are currently serving as military chaplains. For that reason most priests minister alone, and for himself Bishop Bevard found this the greatest adjustment he would have to make when he took up his new ministry six years ago. “The priests come from all over the world and we do not have that glue of having gone to St. Charles Seminary and working closely together for year and years,” he said. However there is compensation to ministering in what is viewed as an island paradise. “I do get a lot of priest visitors from Philadelphia and other places and I am always happy to see them come,” he said. But those are superficial matters. “The people of the Virgin Islands are very faithful and many have received a good Catholic education just like the people in Philadelphia received,” their bishop said.